Google is the biggest brand in the Internet world right now as we are all aware. Therefore, it’s really not a great surprise that Gmail is the most popular email client available right now. The email service started off in 2004 but as an invitation only software and remained so until it was made available to the public in 2007. Since then it has evolved from being a basic email client to now being the most powerful and popular emailing service overtaking the likes of its competitors like Yahoo Mail, Rediffmail, Hotmail, and others. Without further delving into the history of Gmail let us take a look at the features it offers. It started with a storage space of only 1 GB and over the years it has increased. Gmail currently offers 15 GB of storage across Gmail and its associated apps Google Drive and Google Photos for users to store emails and media. It also offers the Gmail Labs option which allows users to bookmark important messages or incorporate custom keyboard shortcuts for Gmail. Google is now mulling over introducing the Google Labs feature as a permanent option for Gmail. The introduction of tabs in Gmail from 2013 has been very beneficial and has been acclaimed by the users. The tab feature contains filters which sort and arrange messages or emails according to their content and other such requisites. There are 5 tabs that the emails are categorized in, namely Primary, Social, Promotions, Updates, and Forums. Apart from having its own filters, Google spam filtering also is community driven which brings in a greater safeguard for its users in general. Whenever user blacklist a spam email id, Google keeps that in its spam database and whenever the same spammer sends an email to another Google user he/she is automatically warned about the spammed content in the mail. The Gmail app is available for Android and iOS platforms and works like most other email apps. A distinguishing feature that the Gmail app contains is that it is available in more than 40 languages. Using the Gmail chat available, one can also use the feature called Google Video and Voice in order to talk to contacts, in the US, Canada, and some other specific countries. The Google Search available in the app is also very powerful as it not only searches for content related to keywords in the email account but also other Google accounts like Google Drive, Calendar, and others. Following the spate of money transferring apps Google also integrated its Gmail with the Google Wallet which is a digital money exchange platform through which users can transfer or receive money from anybody. The Google Wallet can also be used in Internet transactions as well as the real world operations. 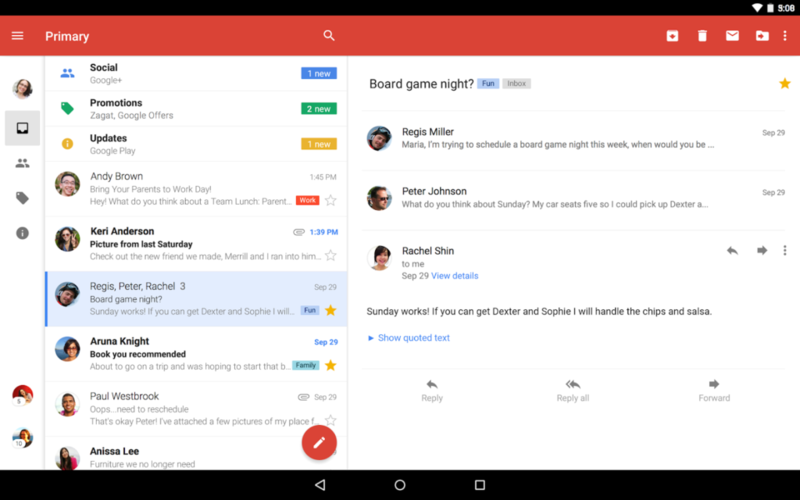 How to get Gmail on your Android device? It is the simplest thing to get the app on your Android device. You just have to visit the Google Play Store and search for the Gmail app. As soon as it appears, you can download and install it. These are the steps which you may follow if the app is not already pre-installed on your device, which, is a very rare occurrence because the Gmail app now comes standard with almost all Android smartphones. If you do not have it and even open your browser to log in to your mail account, you will find that there is a prompt from the browser itself asking you to get the app. A link will also be provided there. In recent news, it was announced that Google has rolled out a new security update for Gmail both on the browser and the app interface because of the continuous rise of malicious attacks and phishing threats. According to Google, the new security feature will add a double layer of security where the company will authenticate the sender of an email, and if it is unable to do so, then the mail will appear with a question mark to the recipient. The new feature will also warn recipient of emails before hand if it is suspected to contain malware, unwanted software or something malicious. From last year Google has been continuously upgrading its security not only for Gmail but also for its browser and extensions. Everything on Google is now encrypted, and it also comes with the new two-step authentication process so that illegal activities can be prevented. Voot 1.4.49 apk download – Watch the latest serials here!